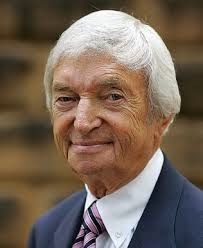 Richie Benaud is more than the voice of a generation, he is the voice of summer for a nation. It was Richie that introduced me to the game of cricket during the Chappell, Lillee, Marsh era. Over the years Richie has taught me the rules of the game the positions of the field and the language of the sport. Yes he is so loved that the nation all knows him on a first name basis. After all he has spent more than 40 years in people’s living rooms across the summer months. He has been with us whilst we play with Christmas toys, fight with siblings, parents and partners, do the ironing, have lazy days in pyjamas, get drunk and take little summer afternoon naps. Richie can also laugh at himself happily commentating on spectators dressed as himself resplendent with beige sports coats and grey hair. Enjoying the send up of himself and the Channel Nine commentary team in Billy Birmingham's “The Twelfth Man”, living the adage that imitation is the greatest form of flattery. Now 84 years of age, Richie was not on air in Australia during the 2013-14 season as he recovered from injuries sustained in a car accident. Now the nation holds its breath for news of his recovery, this time from skin cancer. Partly out of love and respect for the man that his life may continue to be long healthy and happy and partly for more selfish reasons. Summer just isn’t the same without his dulcet tones. It would be fitting for Benaud to retire in his 87th year in a little nod to Australian cricket superstition. The cricketing world has suffered greatly at the beginning of the Australian 2014 summer, with the tragic death of Phillip Hughes. Now more than ever the Australia needs the “father” of cricket commentary to calmly sooth our collective souls and tell us everything is going to be alright.